Based in Portishead near Bristol, Clevedon and Weston-super-Mare, and close to the M5, Enterprise Charters offers excellent Bristol Channel Fishing and Sight Seeing trips as well as short cruises. Providing Up-tide and Reef Fishing for Cod, Bass and Skate, our new, big, fast and stable catamaran is ideal for individuals or groups of up to 10 people. Please phone for more information, bookings or to confirm times. We offer fishing trips up and down the Bristol Channel throughout the year. With it's silty, fast flowing, tidal waters it offers suburb fishing for both beginner and enthusiast. With our local fishing tackle store (Reel Fun) literally a stones throw from our mooring at Portishead Marina, you can be sure that everything is provided for. The Bristol Channel is an eventful part of the South West. With nature around every corner, many small islands within and the man made infrastructure surrounding it, the possibilities for excitement are endless. We can supply you with a wide range of fishing equipment to hire. We always carry enough rods and equipment to ensure ever member aboard the boat can make their catch. Using our 20+ years experience, we can help you land your next big fish! If you require some guidance please don't be shy, speak up and let us tell you the secrets and teach you the techniques. You will be able to park your vehicle for free whilst on your Bristol Channel fishing or sightseeing trip. Simply drive into the Quays Marina car park. With our new fast Cougar Catamaran there is more space to fish on deck. 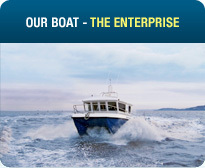 The Enterprise has been featured in magazines such as Boat Fishing Monthly. With our very capable twin Volvo engines, we can get you to your fishing destination faster, you get more time to fish and enjoy yourself. We have a full C.O.P license and we are fully insured to take out up to 10 individuals. For those who can't go over the side, there is a toilet on deck, take a look at all the brand new facilities and equipment within our virtual boat tour. Captain Dave Kirk and his crew have been fishing the Bristol Channel and further for over 20 years. Their expert knowledge of the area is second to none.